This inspirational drama combines faith and football in the tale of high school coach Grant Taylor (Alex Kendrick), who faces a losing team, a fading marriage and the possibility of being fired, but rises above failure to create a winning spirit on the field. While dangling at the end of his rope, Taylor puts his life in God's hands and, in doing so, finds a stronger purpose in this spiritual film. 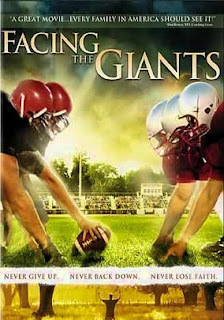 Facing the Giants is an inspirational faith-based family movie that provides a strong message of hope. Feel free to bring snacks and a soda.